Cells contain chemicals which react to produce electricity. The voltage produced by a cell is dependent upon a number of factors including the type of electrode and electrolyte. A simple cell can be made by connecting two different metals in contact with an electrolyte. Batteries, like the ones in torches and mobile phones, are made up of chemical cells. There are many types of chemical cell, each with different chemical reactions. If we connect different combinations of metals to make a cell, we find that the voltage changes. In the table we can see the voltage produced when using magnesium as the negative electrode, and zinc and copper as the positive electrodes. In non-rechargeable cells and batteries the chemical reactions stop when one of the reactants has been used up. Alkaline batteries are non-rechargeable. Rechargeable cells and batteries can be recharged because the chemical reactions are reversed when an external electrical current is supplied. Chemical cells use chemical reactions to convert and transfer energy to electrical energy. They will produce a voltage only up until one of the reactants has been used up (we say the battery has "gone flat"). Fuel cells will produce a voltage continuously, provided they have a constant supply of fuel and oxygen (from the air). Fuel cells are supplied by an external source of fuel (eg hydrogen) and oxygen or air. The fuel is oxidised electrochemically within the fuel cell to produce a potential difference. In this type of fuel cell, hydrogen and oxygen are used to produce a voltage. The only product from this reaction is water. 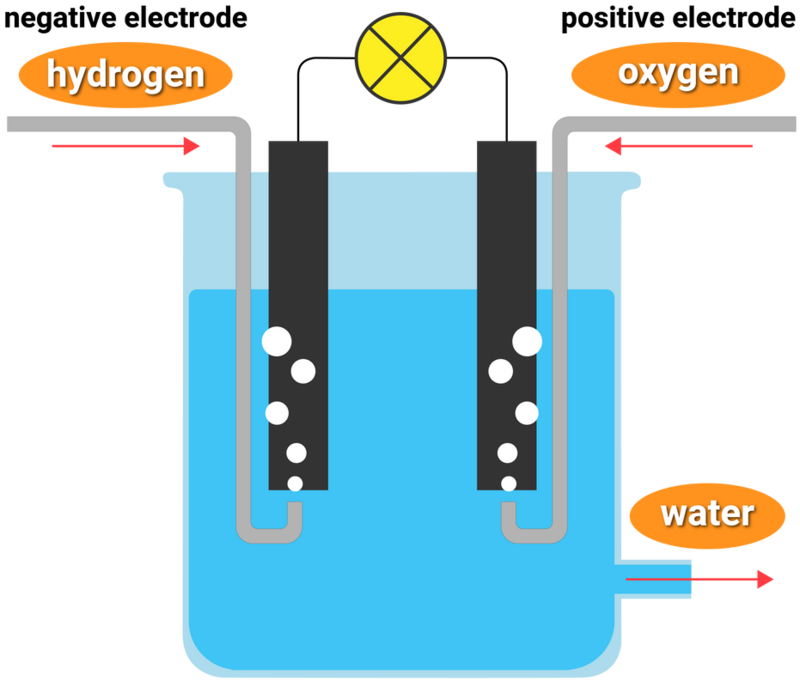 The overall reaction in a hydrogen fuel cell involves the oxidation of hydrogen to produce water. Hydrogen, diesel and petrol are all highly flammable fuels. Fuel cells have their advantages and disadvantages depending on the use.